I haven’t won the lottery, haven’t scored a trip to Willy Wonka’s Chocolate Factory, haven’t been surprised with six months in Italy, but my goodness I am having a super duper fantastic amazing week. Nothing spectacular has happened, but a continuum of really good things have, and even when I was faced with a couple of hiccups earlier in the week that could have turned everything sour, they didn’t. I love this present frame of mind. My favourite ironchickie is seemingly always in that frame of mind. Maybe it’s her New Zealand accent, that chipper lingo of hers always leaving me wanting more. Even when she’s frustrated, she’s able to find that glass half full mentality … and she uses words like bloomin’ to describe her frustration – I kid you not, I swear that’s the word I heard and I was so tempted to pretend I didn’t hear just so I could hear her say it again! Brilliant. 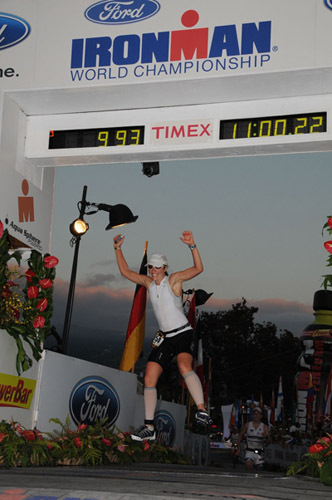 Next weekend my favourite ironchickie and a couple of my other peeps (Evil Pace Bunny and He Who Shall Remain Unnamed Until He Starts Reading My Blog) will be competing in Ironman Canada in Penticton. They have been training for what seems like forever, way longer than what I did training for my marathons. And the fact they’ve made it this far is a testament to the stars they really are. Seriously, they’re superstars! This entry was posted in Training and tagged Aqua jogging, ironchickie, Ironman Canada, Kona World Championships, swim caps. Bookmark the permalink. 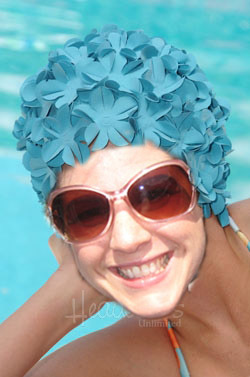 okay Katie where did you get the swimming cap, I had a yellow one just like that when I was a teenager….love it!!!! Harvey and I burst out laughing when we saw the photo!! !